position, unlike similar inferior sensors that use bending beam load cells. The device is supplied complete with cover, cable and connector. output. Several amplifier options are available to suit individual applications. Force Range Bi-directional 1–12Kg (10–120N). Temperature range -10 – +50 deg. C.
1 Flatshifter Amplifier Module. 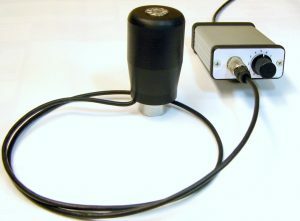 This version connects the gear knob to the Flatshifter shifter system as an alternative to the shift rod ( gear shift sensor). The trigger level is set via the adjusting knob on the amplifier module. 2 Ref. 2.5 volts Amplifier Module. This version gives a 2.5-volt output with no load on the load cell with the voltage rising above or falling below 2.5 volts depending on if the gear knob is pushed or pulled. 3 Ref 0 volts Amplifier Module. This gives 0 volts output with no load on the load cell and gives a positive or negative output depending on if the gear knob is pushed or pulled. 4 Dual Input Amplifier Module. ECU input signal wires for up-shift or downshift are switched to ground at a pre-set trigger level depending on whether the gear knob is pushed or pulled. The trigger level is adjustable via an adjusting knob on the amplifier module. Please note options 2, 3, and 4 require a 12 volt DC supply and ground connection. 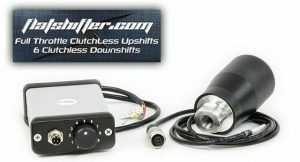 The Flatshifter strain gauged gear knob is supplied with an amplifier module which has normally open relays. The relay contacts close momentarily when hand pressure is applied to the gear to knob. The pressure at which this happens is adjustable between 1 and 10 kg using the adjusting knob on the amplifier module. The relays are rated ay 1.5 amps and usually switch a 5 or 12 volt ECU output to ground. We supplied 3 x Flatshifter “Shift” strain gauged gear knobs for 3 Mitsubishi lancer ex works Dakar rally cars , Owners comments below. I think the best thing is that we totally forgot about them because we didn’t have any issues with them at all. I will look in our picture database and send you some of them. We don’t have any video because it was not allowed to carry an onboard camera during the stages. I will check with RTL because we carried an onboard camera from the organization in one of the cars for a couple days. http://www.youtube.com/watch?v=FAEJbHqA7-M And here’s another one where we broke the lap record and 1st place. at a sprint event, the same year both using flat-shifter Expert system. Radical PR6 Prosport with FlatShifter Max+Pro Systems with Paddles.